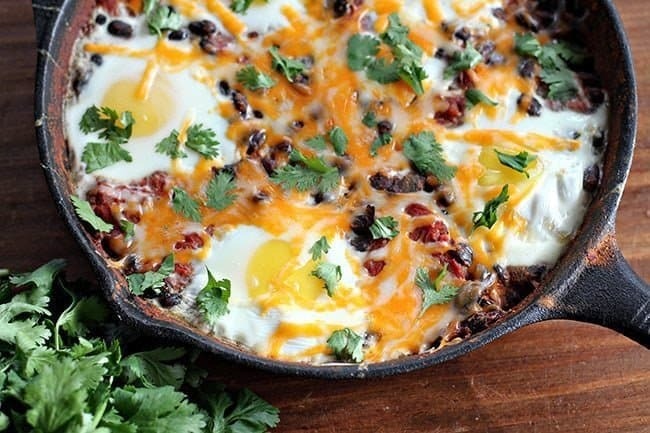 Sunday mornings that start out with a skillet full of protein and vegetable love are good. No, let me rephrase that: they are great. We all know that Sunday mornings in my house are almost sacred; I’m in the kitchen, everyone is in pajamas still and I am almost always making a new dish that I have been waiting to try out. People just don’t eat enough beans for breakfast. There, I said it. I am a huge think-outside-the-box person when it comes to breakfast. I’ll eat leftover dinner, if the desire hitsme, while most people – my husband included- shudder at the fact that I eat leftover roast beef and/or noodles/perogies/you name it for breakfast. I really wanted something thick and beany. Not hot and spicy, not full of tomatoes so that it overpowered the bean taste, but a dish that you could taste the beans and savor the drippy egg yolk with. Let’s take a closer look at those gorgeous, drippy egg yolks and cilantro over beans. It is seriously so darn delicious. My son took leftovers for lunch today at school and I couldn’t be happier that he’s getting a super healthy protein boost at lunchtime. I could eat this every morning, if I didn’t have to eat my darn oatmeal sometimes too. Bah. Oatmeal. Now while this isn’t something that I generally have time for during the week, I was thinking of prepping the beans and tomatoes the night before. The reducing is what makes this so thick and lovely, instead of a watery bean dish, it’s the most important step in the whole recipe. If you did the reducing the night before you could just warm it on the stove quickly, pop the eggs in and you have a ten minute breakfast! So. Are you brave enough to eat beans for breakfast? I am certainly going to be playing around with more beans in skillets for meals the next few weeks, I have a few ideas that I can’t wait to try out! And another thing, is anyone else an “eat anything for breakfast” type of person like I am? Or is it just me? 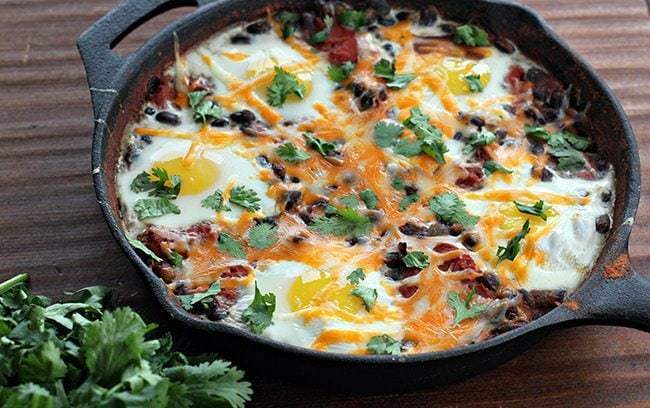 A healthy protein packed skillet breakfast full of beans, stewed tomatoes and eggs on top! 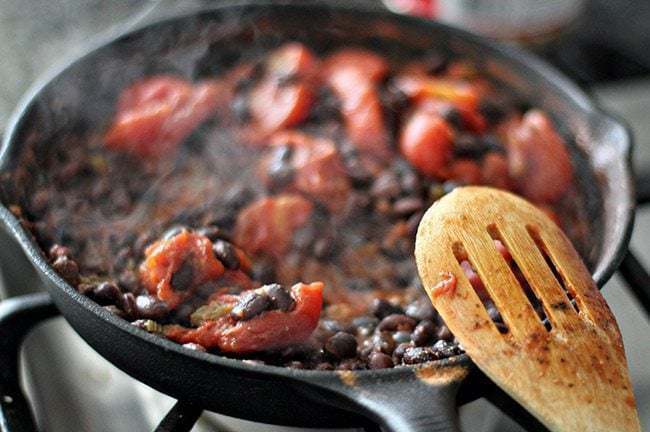 Pre-heat the oven to 450 degrees.Combine the beans, tomatoes and cumin in the cast iron skillet. Cook on medium heat until the tomato juice had been reduced almost completely. This can take up to ten minutes, but it's worth the effort! If you lack time, drain out most of the tomato juice and simmer a few minutes. 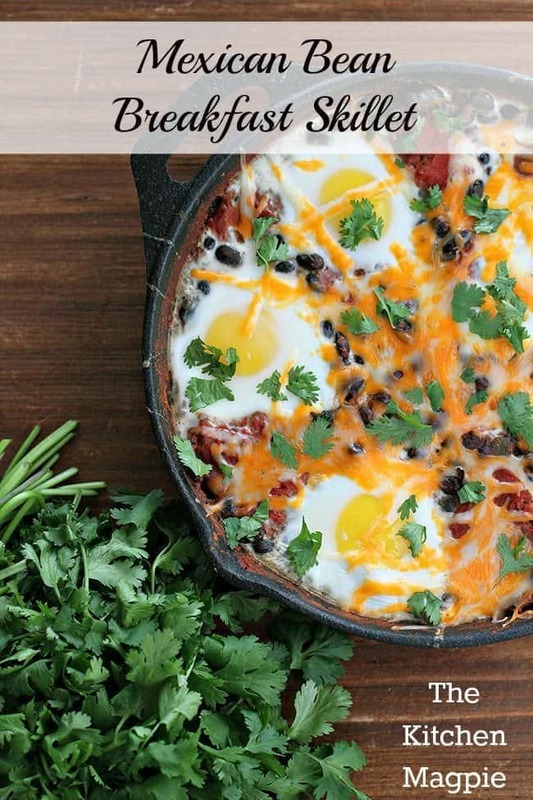 Make five little pockets in the bean mixture and crack an egg into each.Place in the 450 degree oven and bake for approximately 5 minutes, you want the eggs still wobbly and not cooked all the way. Remove from the oven and sprinkle the cheese on top.Place back into the oven until the cheese on top is melted. Remove, garnish with cilantro and serve! Tomorrow, at 2:30 GMT I’m making this. I love beans, but the only beans that I believe are regularly available in India are red kidney beans. So, I’m going to work with the belief that a bean is a bean, which I know isn’t correct. Can I use Pinto beans instead of black beans? Just not a fan of the black bean… I’ve tried several times and just not my bean of choice. I’m also a lover of beans. It is one of the first things I learned to cook as a poor college student. Dried beans are cheap, and easy to cook, but they take some time. Over the years, I’ve found different ways to make the time easier to deal with. My current favorite method is: after dinner, add 2 cups of dry beans (pinto, black, or white) with 6 cups of water and 2 tsp of salt. Bring to a boil, then turn off heat, cover, and let sit overnight. The next morning, add whatever spices and seasonings you like*, and finish them off; either in a crock pot on low all day, or simmering on the stove for 1.5-2 hrs. * I like to add 2-3 cloves chopped garlic, 3/4 cup chopped onion, 1 chopped jalapeno, 1 can chopped tomatoes, 2 tsp cumin, and 1 heaping tsp of sugar. Cilantro is good, but add it during the last 10-15 minutes. I honestly LOVE this meal. It’s healthy but doesn’t taste like it haha my favorite! Definitely trying this one, Karlynn! Reminds me of huevos motuleños! I’d rather eat anything but traditional breakfast foods for breakfast. This sounds great, thanks! superfox12082 Hope you gave this a try! Oh good Carolyn Skoworodko! Glad you enjoyed it! This was so satisfying! Made it tonight for a “meatless monday” dinner. Will be having it again for sure. I think this would be good with slices of potato in it too. Mmm! My daughter can’t stand traditional breakfasts and will always choose left overs above anything else. This looks delicious! trying this out for sure!